Manila: More than 34,000 people from a danger zone around Mayon volcano have been evacuated due to the threat of hazardous eruption, Philippine authorities said on Wednesday. Romina Marasigan, spokesperson from the National Disaster Risk Reduction and Management Council, told media that the evacuation figure due to the eruption of Mayon volcano was brought to 34,003 on Wednesday, Xinhua news agency reported. Marasigan said now the evacuees are staying in 30 evacuation centers provided by the local government. "We want to be sure of their safety because intermittent rain showers are being experienced by the people in that region." 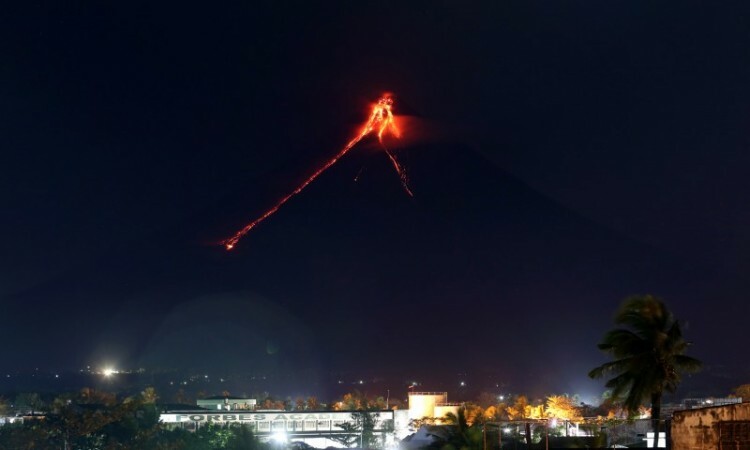 Mayon Volcano continues to ooze lava and shoot up plumes of hot ash, sending fear to affected residents but also a joy to tourists who started to flock Albay, a province on the island of Luzon about 330 km southeast of Manila, to witness the "silent eruptions". The Philippine Institute of Volcanology and Seismology said in its Wednesday bulletin that it had recorded 143 "lava collapse events" and a tremor in the past 24 hours. The volcano's alert Level 3 remains in place, meaning there is a threat of the hazardous eruption in weeks or even days.